A tale about an upcoming Armagedon that mixes a number of popular dark fantasy figurers. Good Omens features a witch, a demon and the anti-christ. It is based on the 1990 novel by the same name. It's a Prime Video Original, so you can stream it there for sure. Where can you stream Good Omens? 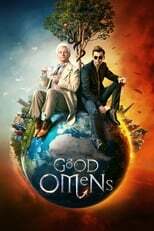 On 2019-05-30 Comedy/Drama TV Series Good Omens first aired on Amazon. Written and created by Neil Gaiman & Terry Pratchett, and produced by Narrativia & BBC Studios, .